I headed out in my Honda Pilot for the three-hour trip to Charleston, SC, Air Force Base from my home in Augusta, GA, on a Wednesday morning. I should have heeded the omen—a constant, torrential downpour-- and turned back right then. However, I was determined to get to Leipzig by sometime the next day. I was scheduled to give some lectures in that old German city on-camera for a private educational firm. If I could get on the manifest for an overseas Space A flight in Charleston, not only would I be saving them airfare, but I would be safe in the arms of the military during my flight with little of the hassle of flying commercial. As it happened, I would have welcomed that hassle compared to what was to befall me over the next four days. Despite limited visibility, the pelting of the rain on my car roof and onto my lap and left sleeve through the open driver-side window, I was able to catch about half of the halting directions from AB (Airman Basic) Sam Gavonovich at the front gate of Charleston AFB. Squinting through sheets of water and with my nose protruding through the steering wheel, I finally located the Passenger Air Terminal. In a moment of arrogant entitlement, since I was a retired Navy captain, I cavalierly commandeered an ‘Authorized Parking Only’ space as close to the building as possible because I knew the next hundred yards were going to be wet ones. Naturally, my golf umbrella was in the rear compartment of my SUV next to my clubs and I wasn’t about to venture outside in this deluge to do anything yet. I still had the ignition on and was mainly contemplating my next move, half-listening to Dr. Laura lambaste a divorced woman with three young children for shacking up with and financially supporting a man she met on-line three months ago. Sanctimoniously happy I didn’t need her advice, I decided to act decisively. In a most ungainly fashion I urged my decrepit body into the back seat over the headrest to get to my raincoat. I realized at once that a raincoat was not meant to be donned while seated in cramped quarters as I struggled to get my arms into the sleeves. Reaching behind me, I almost dislocated my right shoulder trying to unzip the pouch of my golf bag near the tailgate which contained my golf rain suit. Professional contortionists would have applauded if they could have seen and especially heard my efforts to get my rain apparel on without tearing even my shorts. Now clad for a monsoon except for my leather loafers which were ruined in the first 50 yards, I sloshed my way into the terminal and up to the reception desk. I knew instantly because of the echoing laughter and idle chatting of two or three Air Force enlisted and no other visible human beings that there would be no flights to Germany or any other city leaving that afternoon. Indeed, the first hop from Charleston to anywhere was to the West Coast in 48 hours. I was courteously directed to the base long-term parking area about a half a mile away. I figured that if I left my car at the AFB, I could rather easily return from Europe to Charleston in 10 days and drive back home. 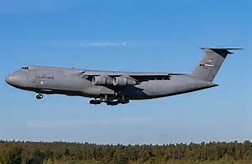 As I understood it, the Air Force’s gigantic C5A Galaxies were home-based in Dover, Delaware—at least they were when I was on active duty in the 1970s. Surely, I thought, if I can get to Dover this afternoon, I could be headed for Europe on one of those big birds maybe even today. Charleston International Airport was only a short, eleven-dollar taxi ride away. I wasn’t even discouraged to find out at the American Airlines counter that the closest I could get to Dover from Charleston was to fly to Philadelphia. Since I’d already saved at least $1500 by my plan to travel Space A, the commercial flight to Philadelphia would be most affordable at $564 and a $25 baggage charge. Moreover, the German company would reimburse me for my travel. I could rent a car and drive to Dover, stay in a hotel, and be first-in-line at the Dover AFB Passenger Terminal in the morning and off to Deutschland. Although the first flight to Philadelphia didn’t depart until 6:15 PM, that was still the “shank of the evening” to me. I was bound to be driving to Dover by no later than 9:00PM. It turned out to be more like 10:00PM. As unfazed as Don Quixote, I left the airport in Philly in the smallest, compact, $227-car money could rent. The rain I left behind in Charleston caught up with me on I-95S heading for the Dover exit 50 minutes away. Had I brought along a passenger, he would have had a death grip on the door handle and a thrilling ride on that unfamiliar stretch of road which was alive with vehicles traveling too fast for conditions in all lanes. Straining to read the Delaware state road exit signs in the driving rain, I found myself headed west instead of east for only 20 minutes before I noted that the mileage to Dover was increasing rather than decreasing. It was only another six miles to the next exit, but I didn’t mind. I’d get the car headed in the right direction in a few minutes and Dover was only 68 miles the other way. I hadn’t counted on getting so sleepy and there were no rest stops on that dark road, so I had to really fight it the last 15 miles to get to a busy highway with hotel choices in Dover. I checked into a Hampton Inn for $132.35, found an Appleby’s nearby, and was able to order a hamburger just before the kitchen closed. In my anticipation about the flight tomorrow and the nightly interruptions of a prostate over 70 years-old, I slept fitfully until 5:00AM. One benefit of my insomnia was that I had first choice for the hotel’s complimentary breakfast and could leisurely pour my coffee and fill my paper plate with scrambled eggs and bacon without elbowing another guest invading my space and impatiently waiting for his turn. I couldn’t return my rental car until 7:30AM, but I got my gear, typed the address into my phone, and the GPS guided me right to the location. After settling up, a very kind Enterprise employee drove me to Dover AFB Passenger Terminal. I was the first potential passenger on the manifest for a C17 to Ramstein AFB in southwest Germany. I was ready to board, but was told that the plane was scheduled to depart at 1700—10 hours hence. No problem—I had lectures to prepare. Other Space A hopefuls, some active duty with spouses and small children, and some retirees and their wives began to check-in over the course of the morning. Because of heavy cargo there were only 17 jump seats for passengers on this trip. I learned, with not a little foreboding, that many of these folks had signed up for Space A travel weeks ago and would be given a seat ahead of me. My heart began to pound at 1300 when the roll call began for travelers, starting with active duty personnel and those retirees like me in the order of sign-up. My loud sigh of relief when they called me for seat number 17 must have reverberated through the terminal at 1400. Baggage and Security check-in was to begin at 1600 which went surprisingly smoothly and on-time. I knew in my Naval bones that there had to be a “hurry up and wait” somewhere in this process and there was. We all sat in the boarding area biding our time, contemplating our navels, and watching seemingly endless numbers of huge pallets being painstakingly loaded by forklift onto our aircraft until 1800. Didn’t they realize that I had to get to Germany? Finally we boarded and sat on the shuttle bus until 1830. At last we were driven to the C17. Because I had been an O-6, I was called by name and ceremoniously asked to be first to board the aircraft. Giving my best impression of false humility, I climbed the ladder (steps in Air Force jargon) and located the jump seat, which I mistakenly imagined would be the most comfortable, and strapped in. All 17 of us were seated and given safety instructions over the din of the Pratt and Whitney turbofan engines and we began taxiing at 1930. There was a moment of the usual excitement as we came to a halt when we were number one for take-off (The only other aircraft on the base was another C17 which had been parked there all week). The engines began to roar, only to be brought back to idle a few seconds later. The enlisted airman in-charge then announced that the aircraft’s radio had malfunctioned and we had to return to the tarmac. It became 2000 hours when we were shuttled by bus back to the boarding area awaiting the repair of the radio. At 2200 we were told that parts for the radio could not be installed and the flight would be scratched until the same time tomorrow. Roll call would be at 1300 as usual. I was less than thrilled at the prospect of another day in Dover, but I assumed that electrical problems like this were minor and I’d easily be in Germany early Friday morning and hop a train to Leipzig. This unhappy turn of events forced us 17 “Space-A’ers” to locate places to bed down at the bewitching hour somewhere in Dover, prompting a scurry of cell phone activity and a race for reservations and too few cabs. Finishing dead last in this competition, my ride-to-a-hotel problem was solved by a Navy enlisted retiree whose truck happened to be parked on the base in anticipation of his return from Europe. I accepted his kind offer of a lift to a hotel assuming I could find a vacant one. As he was dressed in Bermuda shorts, knee socks, sneakers, and a loud Hawaiian shirt draped over an enormous ‘papa belly’, the two of us could not be any more contrasting—or so I thought until his life story began to unfold in conversation. Over a beer in a local tavern he told me he was divorced, had sold all his belongings, paid all his debts, bought a pickup and traveled anywhere he pleased all over the U.S. and the world. He had his Navy retirement check sent electronically to his bank. At night, he located convenient, free parking in whatever city he found himself, and slept in his truck. He belonged to a national health club chain and would go to a local franchise to shower and shave and then, in true Willie Nelson fashion, he was back on the road again. He had apparently lived like this for a year or more. Indeed, on this particular night, he slept in the parking lot of the hotel where I had been able to find a room and, in the morning, drove me back to the Dover AFB Passenger Terminal to finally get on that C17 for Germany. The schedule for baggage and security check-in was exactly the same as the previous day. In between times there were appetizing trips to the drink and snack machines, a scenic hike to the Commissary, mesmerizing vistas of the tarmac, multiple, pleasant visits to the rest room, and riveting small talk with other passengers. What with these activities, along with staring at the ceiling and changing to a new stick of gum when it began to taste like a rubber washer, the hours simply sped by. Full of renewed purpose and anticipation at 1830 we were once again shuttled to our C17 and this time I confidently led my troops to their jump seats. Within 30 minutes we were number one for takeoff, roared and shuddered down the runway and at last, aloft. The 100-decibels of the engines backed down to a tolerable 75 or so as the flaps were withdrawn and by the time we reached cruising altitude, I was well into Nicholas Nickelby on my Kindle. In retrospect, I should have been suspicious because of the smoothness of this flight that it was all too good to be true and an hour into our European journey it was announced by one of the flight crew that a warning light had appeared in the cockpit indicating possible malfunction of the horizontal stabilizers. Because we were still closer to Dover AFB than to McGuire AFB in New Jersey (where there were many C5A Galaxies), we were returning to Delaware. We were back on our original, beloved tarmac at 2130 next to the parked C17 we should have used in the first place. Had there been a genuine problem with the horizontal stabilizers and not just the warning light, I would have prayed rather than cursed in silence. When it was announced at 2230 that the warning light system could not be replaced or repaired and the flight scrapped until the same time Saturday, I knew the trip to Leipzig was over. Even worse, I could sense the powerful vacuum-hold Dover had on me. I simply had to get out of this town and get back to my Honda Pilot patiently waiting for me in Charleston. I summoned a cab and asked the driver to take me to the Dover, DL, bus station. I was determined to take any bus going south. Larger cities have actual bus stations. I never imagined that in some cities the size of Dover, the bus station is a Seven-Eleven store. Friday night in this “bus station” was bustling with all sizes and shapes of humanity in and out for gas, nachos, beef jerky, chips, cigarettes, the Delaware Lottery, and six-packs or singles in a paper bag. The night manager over the angry staccato of rap music in the background informed me that the bus would arrive at 12:15 AM. There being nowhere to sit, I stood astride my suitcase and was thankful to finally hear the familiar roar of the diesel and snorting of the airbrakes of the Greyhound Bus about half-an-hour later. I lugged my heavy bags outside and asked the driver where the bus was headed. I was excited to hear her announce Norfolk, VA, but crestfallen in an instant to learn that I couldn’t pay cash for a ticket on that half-empty bus. I had to have purchased the ticket previously on-line. I could sense that Dover vacuum revving up again. To make matters triply worse I was exhausted, I had no hotel room, and there was a biker’s convention in town for the weekend and no rooms to be had anywhere in that fair city. I dragged my luggage to a hotel across the busy thoroughfare and threw myself on the mercy of the night manager. Her computer initially indicated a full-house, but after a few minutes located a room on the fourth floor for $150 which I took in a heartbeat. Only moments later she had to turn down a would-be guest who came begging after me. Awakening early amid Dover’s negative pull on my life, in an angry panic I got on-line and booked an airline ticket out of Baltimore to Charleston and a bus ticket out of the Seven Eleven to Baltimore, 120 miles away. When I suddenly realized that the bus would arrive only 30 minutes before the flight, I cancelled that ticket only wasting another hour of my time. The plane was to leave shortly after 2:00PM and it was now 8:30AM. I had the phone number of the very religious cab driver who had driven me to the Seven Eleven last night and called getting his voice mail telling me to have a “blessed day.” I indicated I would pay him to drive me out of this infernal city to Baltimore almost whatever the cost. He returned my call about 11:30AM and in fifteen minutes and $200 we were heading there. We arrived at Baltimore International Airport just about the time the plane had pulled away from the gate. One might think that by now I was as frustrated as Jack Lemon and Sandy Dennis in “The Out of Towners” or Steve Martin and John Candy in “Planes, Trains, and Automobiles”, but the freedom from my imprisonment in Dover was exhilarating. The long security lines prior to the next flight to Charleston, the “zoo” of the Hartsfield International connection, and the taxi to the Air Force Base were, by comparison, minor inconveniences in a hellish captivity in the Dover without the white cliffs. My Honda Pilot was as happy to see me as I was to see her and we drove home together in a clear, starry night. Augusta, GA at 2:00AM can be truly beautiful as I found out for a mere $3000.